Enterprise and Agency customers have full access to Web Folders. Professional customers have READ ONLY access to Web Folders. 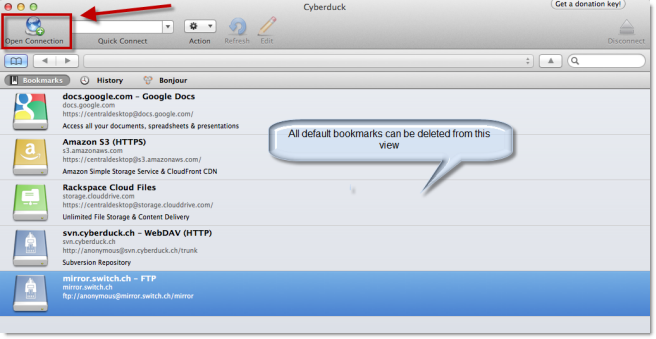 For those of you who are looking for a Mac OS X solution that can improve your WebFolders experience, try using Cyberduck. Cyberduck is a free third-party application and a robust solution for native WebDav support. Speed - Cyberduck is more responsive when compared to a WebFolders setup in an ordinary Mac OS X environment. Ease of setup - Install the application and create multiple bookmarks that manage all types of WebDav/FTP connections. For detailed setup instructions refer to Installation & Setup further down. DS_Store Files => Avoid creating .DS_Store files that normally generate with Apples native WebDav setup. What else can I do with Cyberduck? Open uploaded files in their native applications -- Try opening pdfs, images, or Word documents and have them open with your local applications like Adobe Acrobat, Photoshop, or MS Word for the Mac. Upload/Replace via Drag and Drop and have the changes reflect directly to iMeet® Central. Note: This feature is exclusive to Enterprise plans. 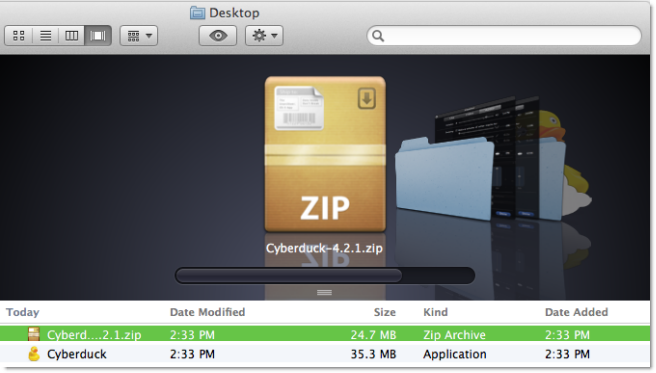 Open the Cyberduck Zip file and the application will unzip itself into the same folder. 3. Installation complete! Proceed to Setup. 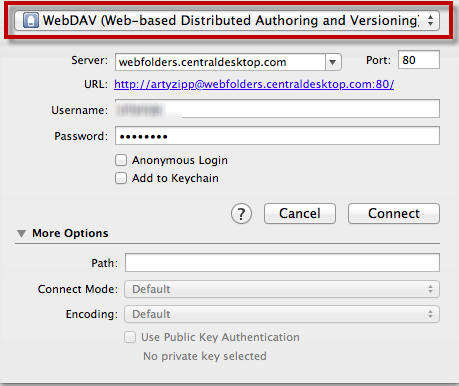 Under the drop down menu select WebDAV (Web-based Distributed Authoring and Versioning). Next to Server: type webfolders.imeetcentral.com. Next to User Name type in your iMeet Central Username. The default action for Cyberduck when double clicking a file is to download it to your local hard drive without opening the file. In the Preferences area you can set all files to open with their native applications and to download to a specific folder. Locate and click on Cyberduck menu near the top left of the screen. Check the box next to Open downloaded files with default application. Change your default download folder for better management of your files. For more information on working with Cyberduck check out their help page.